The iron full-rigged ship British Admiral sailed from Liverpool on her maiden voyage for Melbourne on 7 January 1874. Under the command of Captain Taylor, she carried 38 crew, 49 passengers, and a valuable general cargo. On 17 January the vessel encountered a heavy gale of Cape Finnisterre and lost her mizzen mast, fore and main topmasts and bowsprit, and was forced to limp back to Liverpool for repairs. This was a typical accident to befall the heavily-rigged but lightly-sparred iron clippers of the period, others suffering similar damage around the same time being the Loch Ard and Cambridgeshire which were also fated to finish their short careers in Bass Strait. 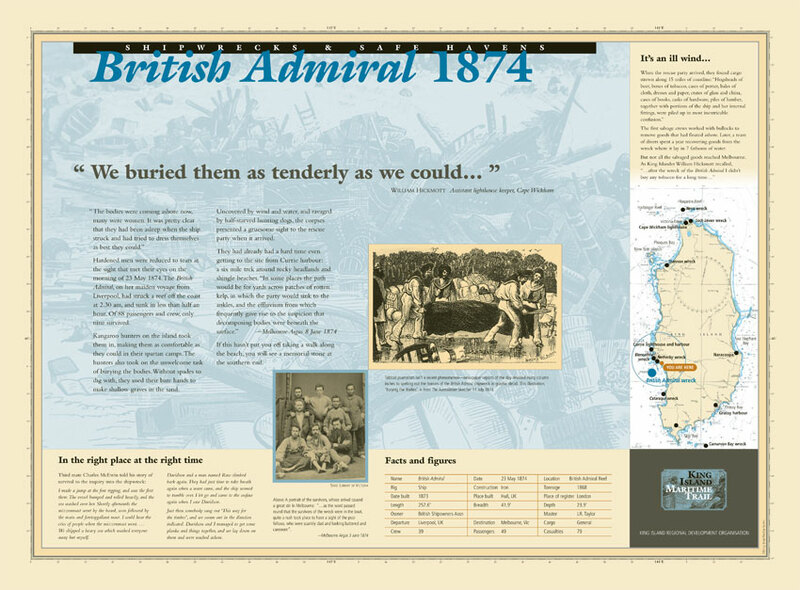 British Admiral finally resumed her interrupted passage on 23 February. After another boisterous passage, during the early hours of 23 May the master was expecting to sight the lighthouse on Cape Otway at any moment when the Chief Officer sighted the coast of King Island. Immediately afterwards, at about 2.20 a.m., the lookout called, “breakers ahead!” Before any evasive action could be taken, the vessel had run onto the reef that now bears her name about two miles offshore between Currie Harbour and the Ettrick River. She was immediately swept by heavy seas which washed many of those on deck overboard, as well as others who struggled up from below. Most of the boats were swept away and lost while being launched, with further loss of life, and others were drowned when the mizzen mast went over the side, followed shortly afterwards by the other masts. A boat near the stern was launched successfully, containing 10occupants including the chief officer. The master ordered him to stay alongside the wreck, but the British Admiral sank within 15 minutes of hitting the reef, and the boat was swept up the coast until it capsized off Currie Harbour. Six occupants, including the chief officer were drowned, but three male passengers and a crewman managed to struggle ashore and later met up with a kangaroo hunter. Meanwhile, another passenger and four crew, including the third officer, had managed to drift ashore on floating wreckage on a beach a little north of the wreck that likewise now bears the name of the lost ship. One of them had drifted into the surf clinging to a spar, and a finger which had become swollen after being forced through a thimble by which he had been clinging to the spar, had to be amputated to release him. They later met up with a party of hunters, led by the four survivors from the boat. A search for other survivors proved fruitless, leaving just nine survivors and a total loss to 79 lives in this, Tasmania’s fourth worst shipwreck. Three days after the wreck, the ketch Kangaroo took the survivors on board and landed them at Melbourne, where the wreck became a sensation. Although the hunters were congratulated for having assisted the survivors, they were in disgrace with the authorities for not having accurately counted the number of bodies they buried, some in unmarked mass graves and others, like Tilly Dale, in individual graves, properly marked. S.S. Pharos was immediately dispatched to investigate, and six more bodies were located and buried. Cargo and wreckage was strewn along 16 miles of coastline. 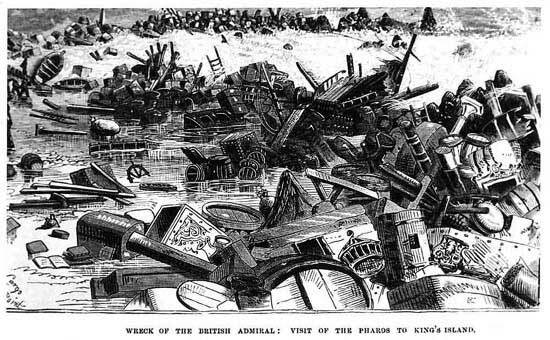 The wreck was sold at Melbourne for 2150 pounds, and over the course of several months a large quantity of cargo was recovered, initially simply by beach-combing, and later by divers sent from Melbourne. A party of stevedores was also sent from Melbourne on board the schooner Cygnet, and the schooner Royal Charlie was sent from the Don River with horses and drays to take the salvage to Currie Harbour, from where it was sent to Melbourne for sale on board a veritable fleet of small craft. The operations were just winding down when the ship Blencathra was wrecked at the entrance to Currie Harbour early in 1875. An inquiry into the wreck exonerated Captain Taylor and his crew from all blame for the disaster. It was thought the chronometers had been damaged during the passage, resulting in inaccurate calculations of the ship’s position immediately before the wreck. British Admiral, O.N. 69,329 was an iron full-rigged ship of 1868/1744 grt/net, 257.6 x 41.9 x 23.9ft., built at Liverpool by T. Royden & Sons in 1873, and was registered at Liverpool in the name of British Shipowners Association. She had just replaced a smaller vessel of the same name which had been sold and was coincidentally also wrecked during the same year.